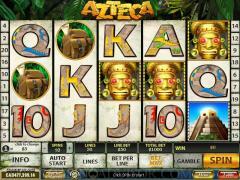 Azteca is part of the new range of Playtech slot games that have been recently introduced into online casinos. This game has a very Aztec theme to it, which is what gives the game its name. The game is mainly aimed at low rollers and mid-range wagers, which is why the lowest possible bet is $0.01 and the highest possible is $100. The game can be played at many online casinos that support the new generation of Playtech software. 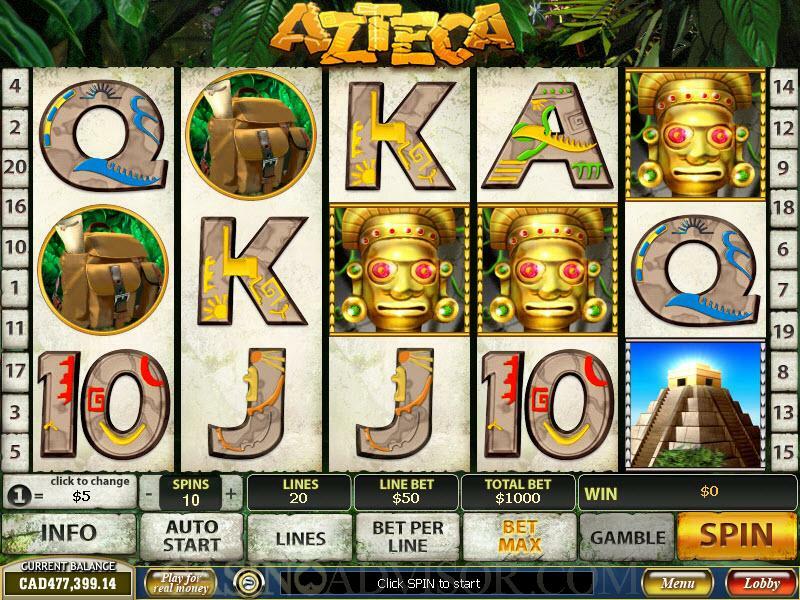 With a jackpot of 10,000 coins, there is a very high rate of return in this game, which is a great enticement for players to play Azteca. Although players can only play this game in one single speed, this is not viewed as a problem, because it helps players pace their gambling very well. For players who do not want to play the free version, and would prefer to wager money in order to win some of the wonderful prizes on offer in the game of Azteca, they will have to play this game using coins. Players are only allowed to wager one coin per pay-line, making the maximum bet 20 coins on any given coin size. The denominations of the coins vary from $0.01 to $5, which allows players to either play a very low rolling game, or wager the maximum amount of $100, which is considered a moderate wager in any slot game. The game’s symbols are what truly represent the theme that the creators have chosen. These symbols are beautifully crafted. The regular symbols are the Monkey, the aeroplane, the Aztec tomb and card faces that range from Ace to ten. Most of the regular symbols have a payout when they appear three or more times. The wild symbol in this game is the Pyramid symbol. Since it is a wild symbol, when it appears on any of the activated pay-lines, it substitutes for all other symbols to complete a winning combination. Like most games, the highest payout and the jackpot are won when five wild symbols appear on any one given pay-line. When the player is playing less than the maximum bet, then he/she is awarded 10,000 coins, however if the maximum bet is wagered, then the player wins 100,000 coins. The scatter symbol in the game of Azteca is the adventurer symbol. This symbol can appear anywhere on any of the reels, and when there are two or more in one spin the scatter winning combination is completed. Depending on the number of scatter symbols that appear on the reels, the player could win up to 500 times the initial line bet, or even 10,000 coins when he/she is playing at maximum bet. When there are more than 3 Adventurer symbols in any given spin, then the player is also additionally rewarded 12 free spins. All wins that are completed during these 12 free spins, get triple the regular payout. 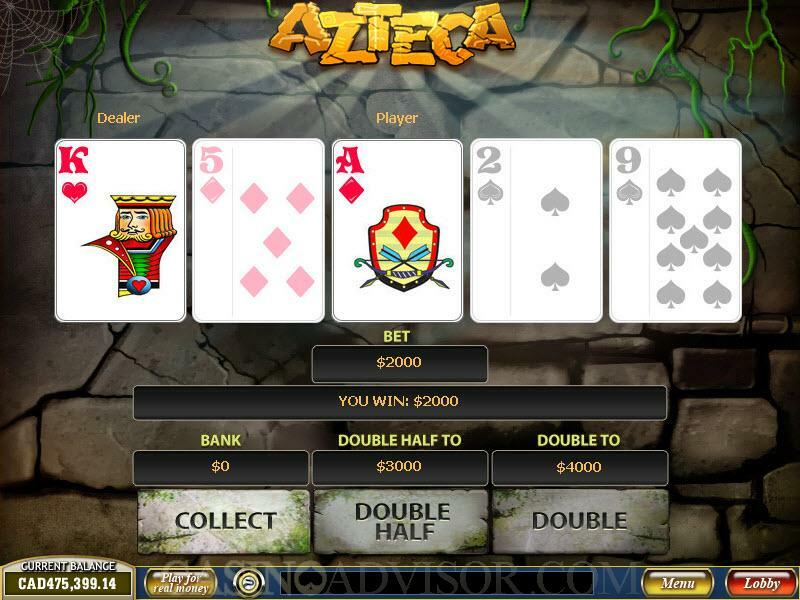 The game of Azteca also has a second screen bonus. This game is triggered when there are three or more Mask bonus symbols that appear on any one activated pay-line. These symbols must be aligned from left to right in order enter the bonus round. If the player happens to get either 4 or 5 mask symbols, then the reward also includes a 5x or 27x multiplier respectively. Interested in reading more detailed information about Azteca? If so Click Here for more details.